How Much Do The Most Expensive Gadgets Cost ? Although most people expect the technology to revolutionize our world and to ease their work, the wealthy people want the devices they use to have as many features as possible. There are only a few millionaires known for their eccentricities in this area. Computers, smartphones and tablets have a price determined in the first place by their performance, but also by the brand. However, when the design is customized, with expensive materials such as gold, diamonds, leather being added – then the value reaches an unimaginable level. Fashion gadgets did not escape the “custom made” industry – from iPhones dressed in gold to extremely expensive laptops. We selected for you the most expensive custom made gadgets. 1. An AeroSystem One iPhone Dock/Speaker costs today $1.115. Many of you would not pay more than a few hundred dollars or euros for a smartphone, so it is entirely out of the question to buy accessories that exceed this value. But Jarre says that the sound system worths all the money, being developed by Jean Michael Jarre and his team. 2. Ego Lifestyle Emerald PC Notebook Computer costs $10.900. Those who are willing to pay almost $ 11,000 for a laptop, could take into account the new Ego Lifestyle Emerald PC Notebook available at Saks Fifth Avenue. Although it claims to combine “high tech and fashion ” with a crocodile leather case, all handmade, technically it has one big disadvantage: the operating system is Windows Vista. 3. Vertu Signature Touch costs about $18.000-$20.000. The design is the one that greatly raises the price for Vertu Signature Touch. The company says that all its smartphones are assembled by hand in England. The phone’s box is made of crocodile leather and titanium alloy, which is said to be 2.5 times stronger than steel, but lighter at the same time. The screen is made of sapphire and is highly resistant to scratches. 4. Luvalgio Laptop costs 1 million dollar. Manufacturer of luxury products Luvalgio, came into notice several years ago when he announced that he produced a million dollar laptop. The product is available on his website, where only the clients can enter. The CNET said that this laptop has a device that cleans the screen, SSD and a blue ray, all included. The details of this model are still little known, although some years have passed since its launch, but it is interesting to see how a one million dollar laptop looks like. 5. Stuart Hughes iPad 2 Gold History Edition costs 5 million dollars. The designer Stuart Hughes dressed an iPad 2 in 12.5 carat gold and encrusted it in diamonds. But not these features made it so expensive. According to information published on the designer’s website, the front of the tablet is made of the oldest rock on Earth, Amol, composed of fossilized shells of ammonites, which raise the price a lot. In addition, it also has encrusted in this rock a fossilized T-Rex bone. 6. Stuart Hughes Black Diamond iPhone 5 costs 10 million dollars. If you thought the 5 million dollars iPad is the most expensive gadget you are wrong. Stuart Hughes also created manually, a gold frame, which includes black diamonds, for an iPhone 5, whose price has reached a giddy level. 7. iPhone Falcon costs “just” 48.5 million dollars. Falcon, a well known luxury brand, has released on september 24, 2014, a line of luxury iPhones that cost around 48.5 million dollars. Along with the platinum iPhone you get a 5-year waranty and a “24-hour worldwide assistance”, so you won’t have to rely on Siri for help and information. Falcon also sells earbuds for just $300,000, if you just need to listen to some REALLY EXPENSIVE music. Should the average working Joe get any of these gadgets ? A fast and simple answer would be No. Unfortunatelly these gadgets are not for normal people working on a decent monthly salary. A lot of rich people couldn’t afford these gadgets or wouldn’t buy them even if they had enough money. To be honest, it doesn’t even make a lot of sense to spend that much for gadgets, seeing that new models will always pop up, making it impossible for you stay on track of this gadget fashion. 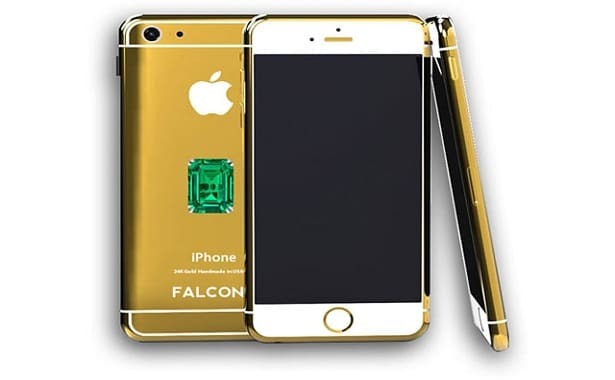 https://www.thepricer.org/wp-content/uploads/2015/03/Falcons_customised_48_million_iPhone_most-expensive-gadgets.jpg 380 615 qSign http://www.thepricer.org/wp-content/uploads/2016/11/pricerlogonew.png qSign2015-03-25 23:47:262015-06-04 13:22:47How Much Do The Most Expensive Gadgets Cost ? How Much Do Maternity Clothes Cost ? How Much Does It Cost To Start a Laundromat ?